Papergreat: Book Cover: "Invaders of Earth"
Subtitle: "15 exciting stories of invasion from outer space"
Notes: This 25¢ paperback, title #1074 from Pocket Books, contains 15 of the 22 short stories that were originally published in a 1952 Vanguard Press hardcover with the same title. ... 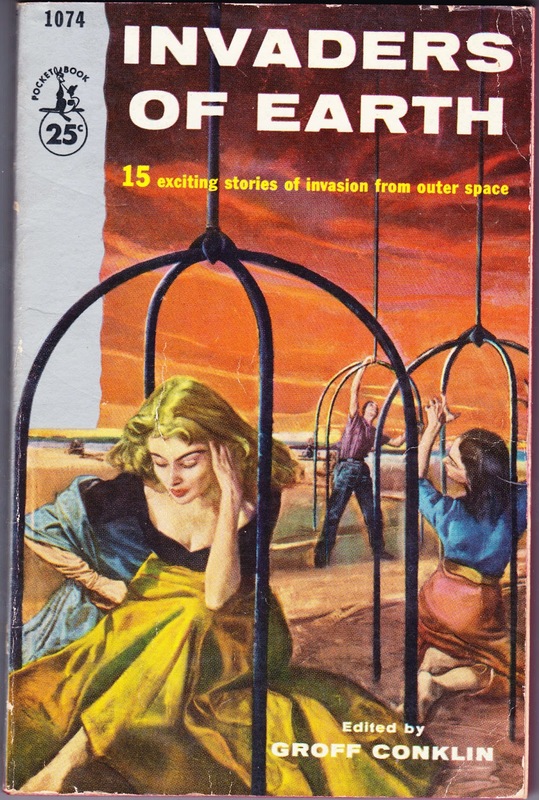 The book features a selection titled "Invasion from Mars," which is Howard Koch's radio treatment used for The Mercury Theatre on the Air's panic-inducing adaptation of The War of the Worlds in 1938. ... Other authors featured in the anthology include Eric Frank Russell, Theodore Sturgeon, Milton Lesser, Mildred Clingerman, Katherine MacLean, and William Tenn. ... Editor Conklin (1904-1968) was responsible for more than 40 anthologies, most science-fiction, during his lifetime. The first of them was 1946's 785-page tome The Best of Science Fiction. Regarding Invaders of Earth, one Amazon reviewer writes: "Groff Conklin is a terrific anthologist. Too bad they do not make 'em like that anymore. And I mean both the anthologist and the stories!" ... I believe the cover artist is the same Morton Roberts whose short career involved well-regarded artwork for magazines such as Collier's, Redbook, Life, and McCall's. He died of a heart attack in his mid 30s. I hope those cages have a transparent barrier. Those bars are kinda far apart. I love the campy cover art of the period, thanks. That looks like a real blast from the past. Love those fifties outfits lol. But I do have a nostalgic side that loves all this old kind of b-movie material. I have always liked science fiction, and am always on the lookout for new exciting writers, my Kindle collection continues to grow!